A highly absorbent option for busy care homes, our Bed Pad Without Flaps offer a comfortable and patient friendly alternative to traditional plastic sheets. Designed to draw moisture away from the surface swiftly and allow patients to continue enjoying comfortable surroundings, this thick bed pad is the ideal option for those dealing with a variety of incontinence related issues. 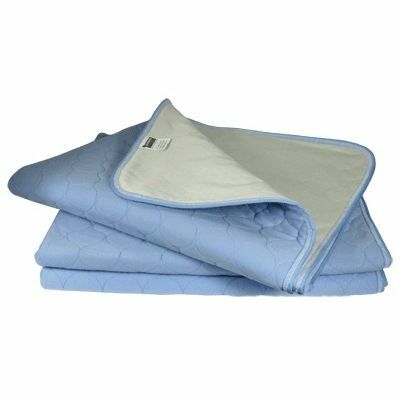 Able to draw in up to 3 liters of fluid and bound with stitched edges for a more durable and long-lasting finish, these pliable pads sit easily above your sheet and keep mattresses and other bedding from getting damaged at any time. The perfect option for high-traffic laundry rooms too with the ability to be washed at 95°C and tumble dried on low heat (below 77°C) for continued softness. Along with our bed pad's, Gompels also stock a range of incontinence challenging products from Adult Nappies, Incontinence Pads or other forms of Waterproof Bedding and all at affordable and economical prices.